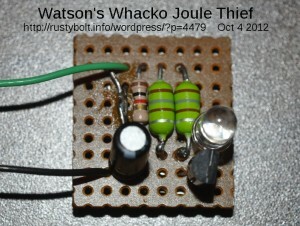 2012-10-03 When Is A Joule Thief Not A Joule Thief? Well, I saw this way of emulating a coil in the Wikipedia entry for Joule Thief. I said to myself, this is really Mickey Mouse, and it would never withstand the scrutiny of an engineer or designer if they saw it. It’s just not the way a circuit should be designed. But I did it just to see how it worked. What I did was put two 180 microhenry chokes (the green blobs) side-by-side so that the electromagnetic field from the choke connected to the collector is coupled through the air to the feedback choke connected to the base so that it generates enough current to keep the circuit oscillating. After I built it, the first time I powered it up it didn’t oscillate. I had to rewire one of the chokes – swap the wires – so that it was phased properly. The connections were originally with the top lead of one choke connected to the +1.5V, and the bottom of the other choke connected to +1.5V. But that was the wrong way, the tops of both chokes had to be connected to +1.5V for it to oscillate. Some of my resoldering can be seen in the photo. The LED was a blue superbright LED. The transistor I used was an SS8050, which is capable of handling more than an amp of current. The supply current went above 110 milliamps and the LED became very bright when I turned the supply up to 1.5V; I thought that the current was excessive, and I turned down the supply to 1.25 volts, where the current was a more comfortable 75 milliamps. The current at 1.5V should be reduced by changing the resistor to a higher value; 1.5k or more would help. Or else use a much more common 2N4401 or PN2222A. Also, the 180 uH chokes each have about a 2 ohm DC resistance. This is excessive, a better choice would be to use a 100 uH choke that has a DC resistance much less than 1 ohm, preferably 1/4 ohm or less. This only applies to the choke connected to the collector; the feedback choke doesn’t matter. Whatever choke is used, it must have an open core; the windings cannot be covered with anything that prevents the magnetic field from escaping. Without the external magnetic field, the circuit won’t work. So the answer to how well it works is it works just fine. But I wouldn’t put it into service without covering the two chokes with a thick coating of silicone glue to keep them from moving away from each other. This Mickey Mouse way of emulating a two winding coil is a simple way of satisfying those people who claim that winding a coil on a toroid core is too much trouble. There is nothing to wind! And you don’t need a second transistor and all those other parts that a two transistor V boost circuit must have. And then there’s the cost factor. The best of both worlds? Maybe, but I still think it’s Mickey Mouse. Update Sep 7 – I built a third one, using a different transistor, a BC337-40. I’ve used the BC337-25 in Joule Thiefs with excellent results. When I finished assembling this circuit, I applied the power and all I could get was as brief flash of light when I touched the lead to the circuit. It would not stay lit no matter what I did. Then I remembered that I’ve had a problem similar to this before, when the current gain of the transistor is too high or the resistor is too low. I found that the problem was excessive current, and I could find out by turning the supply voltage down. So I started to turn the supply voltage down, and when I got below 1.2 volts, the circuit started to try to stay lit longer. I continued to decrease the voltage, and when I got to 1 volt, the LED stayed lit. I went a bit lower, down to 0.9V, and the LED was stable and very bright. The supply current also came down, to a more reasonable 65 mA. At 1.2V it was over 150 mA. The frequency was 19 kHz. The BC337-40’s higher current gain was obviously making the circuit much more sensitive to the supply voltage. This would not have been a problem if it was a lower current gain BC337-25. Well, this wouldn’t work with a fresh 1.5V cell, so I decided to add a 10k trimpot in series with the 1k resistor. When I adjusted the trimpot, the LED stayed lit when the supply was at 1.5V. I removed the supply V and measured the total resistance value and it was about 4000 ohms. I noticed that if the resistance was too low, the supply current would be too high and the LED would get dimmer, counter to what would be expected. I repeated this procedure a few times and found that the optimum values for best LED brightness were between 4000 and 5700 ohms. Somewhere in the middle, around 4.7k, was the best spot for a good compromise between brightness, supply voltage and supply current. The frequency was about 58 kHz. So far this design, even though I still think it’s Mickey Mouse, seems robust enough for the average experimenter to build and use for a Joule Thief. All of my assemblies have been using 180 uH chokes, which have a DC resistance of 2 ohms. I found a single 100 uH choke and I measured its DC resistance at well under 1 ohm, so I think the circuit would benefit from using this lower resistance choke. But I only have a single one – I have many 100 uH chokes but they all do not have an open winding. So I will have to order some open winding 100 uH chokes soon. I’ll then be able to compare the performance of the lower resistance choke. Any chance you’d post the schematic? It’s hard to tell from the photo. It is a standard Joule Thief circuit, but instead of two windings on a toroid core, I used a choke (inductor) for each winding. You can find the circuit in the Wikipedia wiki for Joule Thief. However, in my opinion this wiki has errors and omissions. See my blog about this. You have an electrolytic in your circuit. If you published a schematic, or at least a BOM list, then we would have enough information to duplicate and verify your results. Why publish a blog with insufficient information? We want to give you credit, but can’t if we can’t tell what you really did. Thanks for listening. As I explained in the earlier comment, it’s the standard Joule Thief circuit which is found in the Wikipedia wiki for Joule Thief. If you look at #8 under references you will find this link. It shows the schematic. The electrolytic capacitor is optional and is across the battery + and -. It helps if the cell is used.